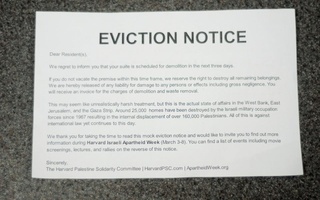 Some Harvard students returned to their dorms Sunday to find eviction notices taped to their doors. No, the College had not decided to move ahead with its House renovations early. Rather, the Palestine Solidary Committee posted the fliers to publicize Israeli Apartheid Week, an international campaign designed to raise awareness about harmful Israeli policies toward Palestinians in the occupied territories and to advocate for the Boycott, Divestment, and Sanctions movement. While the human rights abuses that the PSC highlights demand recognition and rectification, Israeli Apartheid Week—in its international and local iterations—discourages civil discourse, leaving little hope that the event might promote a dialogue contributing to peace or reconciliation. The PSC is not alone in criticizing Israeli practices in the West Bank and East Jerusalem. In January, a United Nations panel presented a report declaring that Israel’s transferring its citizens to settlements in Palestine violated the Geneva Conventions. The report noted that the Israeli government maintains a “system of total segregation” in the territories, where native Israelis reap the benefits of preferential legal status while Palestinians find themselves barred from accessing basic resources such as water, education, and housing. Days before the report’s publication, Israel became the first country ever to boycott a U.N. Human Rights Council review, and the Israeli government refused to recognize the report as legitimate after its filing. Israel must come to the table on the question of the occupied territories. Unfortunately, Israeli Apartheid Week in its current form prevents exactly this type of conversation. The campaign spreads its message through methods that are combative rather than constructive, alienating Zionist members of both the international community and the Harvard student body. 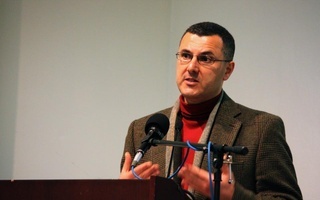 Any productive dialogue on the topic of Israel-Palestine must include Zionists as well as pro-Palestinian advocates. Papering dorms with eviction notices, erecting a wall reminiscent of the separation barrier along and within the West Bank, and referring to the whole event using a word as fraught with painful history as “apartheid” may provoke thought for students who have not yet come to hardened positions on the conflict in the Middle East. But these acts seem even more likely to cause a knee-jerk, negative reaction among groups who necessarily make up an essential element of any peace process. Pro-Israel groups, for example, will likely feel reluctant to parley with an organization that compares Israel to the racist, universally condemned Afrikaner regime of 20th-century South Africa. Although it is clearly the point of Israel Apartheid Week to make this very comparison, it is nevertheless an analogy that ignores crucial complexities in Israel-Palestine. Moreover, the Boycott, Divestment, and Sanctions movement promoted by Israeli Apartheid Week states on its website that the existence of the state of Israel constitutes “Jewish colonization,” a conclusion that can only be reached, at best, through a gross mischaracterization of Jewish and Israeli history. Such rhetoric not only reflects a misguided reading of history, but it is also directly counter to the cause of peace and mutual understanding between Israelis and Palestinians, which can only be achieved if each nation affirms the legitimacy of the other. 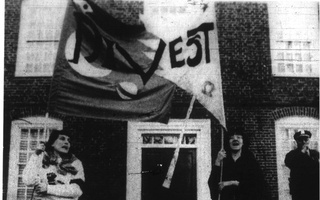 In its mission statement, Harvard College urges its students “to respect ideas and their free expression, and to rejoice in discovery and critical thought.” The case of Israel and Palestine, in which elements on both sides have consistently proven intransigent in their unwillingness to recognize each other’s right to exist as a state, exemplifies the need for such open, respectful discourse among participants with differing viewpoints. Israeli Apartheid Week, unfortunately, does not pave the way for this sort of constructive dialogue and cannot be called a constructive step on the road to peace in the Middle East.